My name is Gary Crowley and my mission is to get you out of pain. Just follow along with the videos on this website and there's a great chance you can eliminate your own pain, just like the thousands of others before you. This approach has been developed over more than 25 years in my practice as a chronic joint pain specialist. Only the most effective methods - in my work with over 30,000 bodies – are included on these pages. WHICH YOU CAN DO YOURSELF. The 3 Simple Steps that I teach can be performed by anyone…and they will eliminate 95% of joint pain. Neck pain, shoulder pain, wrist pain, lower back pain, knee pain, etc. can usually be eliminated by doing one, two or all of The 3 Simple Steps. BONES only go where MUSCLES pull or hold them. Bones don’t move on their own - this is very important to understand. Bones are basically chunks of calcium. They are just anchors or leverage points that enable muscles to perform their jobs. Bones are important building blocks, but they can't do anything without the muscles that attach to them. MUSCLES only do what NERVES tell them to do – and we know exactly where those nerves are for each muscle. Every muscle in your body has a nerve pathway - the dermatome chart to your right shows the superficial nerve pathways in the body. By tracing and releasing the muscles along the nerve pathway for your specific joint pain, you can often free yourself from joint pain. 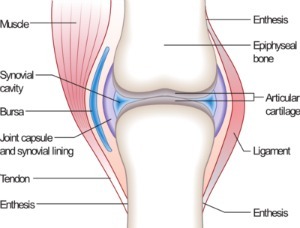 JOINTS are made up of bones, muscles, and soft-tissues like tendons, ligaments, and cartilage. It is only the MUSCLES that are dynamic enough to rapidly affect the alignment of a joint in a positive and stable way...by releasing the inappropriate tension in the muscles that are negatively affecting your joint. YOU can be taught simple techniques to release the MUSCLES and free the NERVES that are the cause of 95% of all joint pain issues. These 4 Basic Facts are the reason I can teach you do-it-yourself joint pain relief. Knowing how to release the right muscles and free the right nerves are the master keys to eliminating, or at least relieving, your joint pain. You see, the above principles apply to ALL the joints in your body. Whether you are seeking lower back pain relief, neck pain relief, shoulder pain relief, etc…the principles all apply. Consider how good it would feel to have joint pain relief at your fingertips, wherever and whenever you needed it. You’re about to discover that it feels great. The ability to fix your own joint pain… and even provide joint pain relief to others …is a wonderful skill to carry with you through life. Below are "The 3 Simple Steps" described in detail. I will walk you through these steps for every single kind of joint pain relief listed to your left. Release the belly of a tight muscle that is causing it to pull too much on a joint. When it comes to joint pain, where it hurts on your body is quite often not why it hurts. Joint pain is often felt when a muscle's attachment to the bone - a tendon - has become inflamed. This is often labeled tendonitis. Think of a tendon as the roots of a muscle that keep it attached to the bone. But the cause of that inflammation is most often not where we feel the pain. The cause of the inflammation is most often the overly tight belly of a muscle that is pulling on that tendon. Like a backhoe pulling at a tree stump, it's the root of the muscle...the tendon...that takes the stress of the pulling by a tight muscle. The pain is in the tendon (the root)...but the cause of the pain is in the muscle. For example, a tight calf muscle is often the cause of a painful achilles tendon. If you release the tight muscle that is pulling on the attachment to the bone, the pulling stops. When the pulling stops, the pain you feel at the root will often immediately go away. Really. I've done it thousands of times. Release tight muscles along the nerve pathway(s) to the joint. Unhealthy muscle tissue - tight muscle tissue - is tender when you press on it. This simple fact allows you to easily identify any unhealthy muscle tissue in your body. Except for a few skull muscles, every muscle in your body is fed and governed by a nerve that comes out of your spine or tailbone. If that nerve is pinched or pulled in any way by tight tissue along its pathway, you may feel the pain anywhere along the path. A tight muscle yanking on a nerve is just like a kink in a garden hose. A restriction anywhere along the entire nerve pathway can affect the nerves ability to function. This often results in numbness, weakness, or pain further down the line from the restriction. If you press on all the muscle tissue along the nerve pathway or where your pain is felt you may find some tender spots. If you release that tight tissue, which will no longer be tender when it's released, your joint pain may suddenly disappear now that the entire nerve pathway is clear. This happens every week in my practice. Release tight muscles that cause joint imbalance. Healthy joints are supported and held together by healthy muscles. And healthy muscles are NOT tender when you press on them. All the muscles that attach to or affect a joint must be properly balanced or the joint will lack the appropriate space, freedom and positioning to function properly. Muscles in the human body are like the rigging (the ropes) on the masts of a big old-fashioned sailboat. The rigging must have all the tension in the ropes balanced for everything to work. If some of the rigging (muscle tissue) is inappropriately tight, it negatively affects the boat's (your body's) ability to function. In order to be pain free a joint requires all the muscles that hold it together to have the right tension. Then the joint can properly function. Proper function requires healthy muscle tissue. And healthy muscle tissue is NOT tender (painful) when you press on it. When it comes to joint pain, most muscles do not need to be strengthened - they need to be released! Imbalance is most often from tight muscle tissue, NOT a "weak muscle." Tight muscles are functionally weak. Once they are released they are then strong enough to do their job. Now all we have to do is check all the muscles for your specific joint pain. When we release the unhealthy muscle tissue that is causing your pain, your pain will suddenly go away. I do this every day in my practice. At first glance The 3 Simple Steps may sound like a lot, but don't worry. I will walk you through every step for each and every joint on the navigation bar to your left. I'll show you exactly what to do for each specific type of joint pain. You will be pleasantly surprised how easy this is...and you will love having the ability to give yourself joint pain relief whenever you desire. First, it's important that you visit the joint pain relief Techniques Page (click here) where I'll review the very simple techniques you'll be using to free yourself from joint pain. It will take just a few minutes to watch the videos. Second, after reviewing the techniques page, just click the on the navigation bar link on the left column of the page that corresponds to the joint pain relief you want to fix and we'll get to work. Again, I'll be there to walk you through every step. Go directly to the joint pain relief Techniques Page now (click here). For further discussion about this Natural Cure For Joint Pain (click here). Your channel [videos] really helped me with a problem I'd been facing down for a number of years and I wanted to reach out and say thanks. I'd literally been bounced around and misdiagnosed by a number of doctors and specialists for the past 7 years and spend north of about ten thousand dollars trying to fix a problem that you helped me to solve with a $2 lacrosse ball and a piece of string. I was in constant agony and my pain is completely gone now and I am dumbfounded by how dead simple the remedy was. None of the doctors or naturopaths or alternative medicine practitioners even came close to solving my issue. You really helped me get my life back and I am forever in your debt. I hope business and life are well.